September brought new experiences of camping in Lassen, NP during early autumn and fulfilling a lifelong dream. I have been to Lassen quite a few times, however, always during the summer months, so it was quite a treat visiting later in the season. Beyond the cooler days and nippier nights, was the significantly reduced crowds. While Lassen is never teeming with people like Yosemite or Yellowstone, it can be busier during the summer when people are camping for Independence Day or while on their kid’s summer vacation. In mid September however, Manzanita Lake was rather quiet and open campsites were everywhere. My Dad and I had almost the pick of the campground and we were able to find a nice spot that was secluded but not too far from the bathrooms (strategic planning is key!). The trails were practically deserted; on the busiest trail I encountered no more than fifteen people the whole ten miles. During the early to mid summer, Lassen teems with wildflowers, vibrant greens, rushing streams, and baby wildlife. During September however, the park drapes itself in a mantle of golden dried grasses, subdued creeks, still forests, and lonely lakes. During our hike into the backcountry, I was amazed at how remote and lonely the landscape felt. It seemed if all of Lassen waited along with the withered meadows for the onslaught of Winter. I’ve always wanted to hike the PCT (Pacific Crest Trail) from Mexico to Canada. It would take me a good six months to hike the whole trail, so for the moment it remains a distant dream. Even though it’s not attainable in the near future, it doesn’t dissuade me from thinking, reading, and dreaming about the PCT. I know that the PCT runs through Lassen, so I wanted to make sure I could hike along at least part of it! 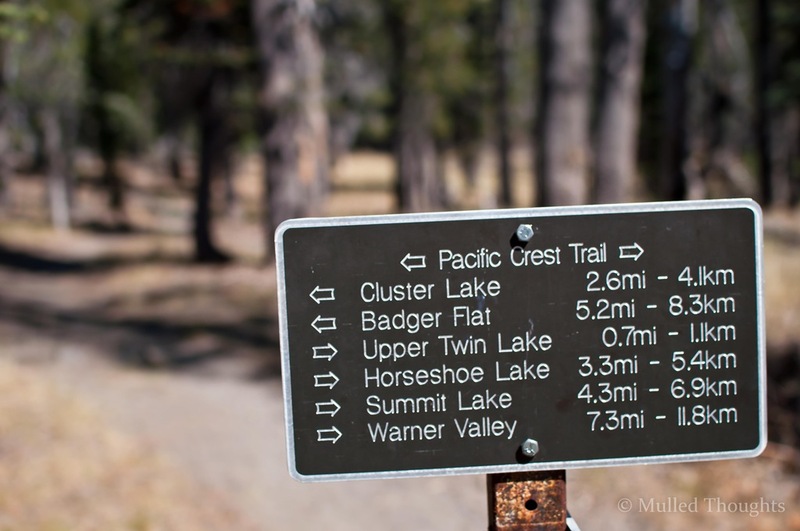 One of the trails in the heart of Lassen wanders along several lakes and eventually meets and joins the PCT for a bit before branching back towards the trailhead. Even though the shared part of the trail was less than a mile, I still felt almost giddy to hike on the PCT. Another thing that added to the thrill, is that I hiked it alone. My dad opted to stay behind at our lunch spot along one lake, while I ventured ahead with a light pack. I could easily imagine myself cruising along the trail with a heavy backpack, trekking poles clicking, and thinking about where I would need to set up camp for the night. Maybe someday I can make that particular dream a reality.